Like its predecessor, MyChron5 2T gives the chance to control two engine temperatures instead of one, coming from thermocouples or thermoresistors. Fully compatible with MyChron4 add-ons Adding new modules you will get all the additional information you need: LCU-One, perfectly tuning the carburetion of your engine. MyChron Expansion, the channel multiplier that permits to check when you brake and accelerate, as well as Power Valve behaviour Smartycam, for professional videos with real-time data overlayed. 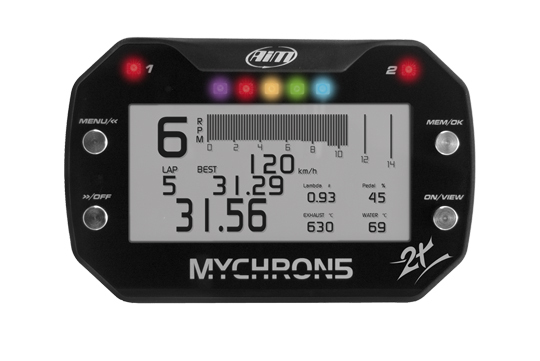 The AiM MyChron5 has a high-resolution graphical display for the indication of rpm, speed,lap times, gear, one temperature, satellite reception and the data from the connected expansions as the lambda or MC-Expansion. It is possible to configure several display pages free and to select them over the 4 buttons. The display-illumination can be set in 7 different colors and the brightness is controlled by a light-sensor. The Speed is gathered over the integrated GPS-Module, indicated on the display and can later with further GPS-channels, e.g. driven line, acceleration? be analyzed on the PC. The screwed on Lithium battery supplies the MyChron5 ten hours with power and can then be either charged or swapped. It also can be supplied by an external battery.